Once upon a time investors took a holistic approach to their investments. Whether individuals or institutions, they would seek to generate returns by balancing stocks, bonds, and cash in a single portfolio. This was the first investment management paradigm. This approach was primarily implemented by the trust department of the neighborhood bank. This paradigm suffered two great weaknesses: mediocre returns and lack of accountability. These weaknesses were the seeds that enabled a whole new investment management industry and a shift to the second paradigm: the relative performance game. Evaluating the success of a manager with the holistic approach was tricky. With the relative return approach, in contrast, clearly measurable passive market indexes provided the benchmark against which performance could be measured and investment managers held accountable. The second paradigm fits nicely with modern portfolio theory (MPT) and seminal academic work on performance evaluation. With a final push from regulatory changes, the ERISA act of 1973 in particular, the second paradigm firmly established its roots in the United States and elsewhere. However, the introduction of clear and meaningful performance evaluation highlighted one of active management’s greatest weaknesses: poor performance. “Beating the benchmark” became the focus of a negative-sum game where only a small minority of managers outperforms the benchmark on a consistent basis. The introduction of a market benchmark introduced further negative phenomena such as an incentive to focus on asset growth (as opposed to performance), to execute trend following strategies (as opposed to contrarian strategies), and to seek mediocrity (as opposed to meritocracy). Throughout the 1990s it became clear that in the relative return paradigm one cannot win Charles Ellis’ “loser’s game,” that there are more investment strategies than buy-and-hold, that increased market liquidity allowed efficient replication of major market benchmarks through passive strategies, and that any alpha, once isolated, could be transported onto any liquid market benchmark. As a result, interests between investors and managers had become misaligned. Absolute return strategies are increasingly being embraced by individuals and institutional investors as the third investment paradigm. The absolute return approach seeks to solve some of the issues of the relative return approach. Investors introduce an absolute yardstick against which managers get measured. This avoids some of the pitfalls of the relative return approach, namely peer-group hugging, search for mediocrity, and misalignment of interests between manager and investor. However, the absolute return approach introduces new issues to be resolved. First, the loose mandate of absolute return managers (i.e., the lack of tracking error constraints) results in a wide dispersion between managers. This means that the costs and risks of manager selection as well as potential benefits are higher with the absolute return approach than with the relative return approach. Second, a paradigm shift (i.e., the introduction of something new) reduces transparency and increases costs. This is an advantage for early adapters picking up a risk premium, but a disadvantage for latecomers. Active asset managers are hired and paid to exploit investment opportunities. Any investment opportunity, to state the obvious, involves risk. Absolute return managers manage money similarly to relative return managers, with the risk-free rate being the benchmark instead of a market index. However, absolute return managers do not hold positions that are passively replicable at low cost. Absolute return managers define risk as total risk, whereas in the relative return paradigm, risk is defined relative to a benchmark, that is, risk is defined as active risk. Unlike with relative return managers, the paramount objectives of absolute return managers is avoiding absolute financial losses, preservation of principal, as well as actively managing portfolio volatility. Defining risk as active risk means that it is the market that determines the investor’s risk, and not the manager. A further difference between the relative return and absolute return approach lies in the opportunity set. Putting it crudely: The absolute manager invests in the full range of investment opportunities whereas the relative return manager does not. An absolute return manager, for example, can hedge unwanted risk, can change risk profile by levering and delevering according to changes in opportunity set, can exploit inefficiencies on the short side, or can explore valuation differences among equal or similar financial instruments. For a skilled asset manager, a greater pool of investment opportunities leads to greater performance. There are also differences in terms of the magnitude of the investment opportunities in addition to differences in the opportunity set. If a relative return manager has a large cap U.S. equity market index as investment benchmark, he or she is forced to exploit inefficiencies in one of the most efficient financial markets in the world. The magnitude of mispricing is unlikely to be large and the cost of finding the inefficiency prohibitively high. All investors define risk as total risk, that is, as destruction of principal or wealth and not being able to meet liabilities. Total risk is like an iceberg (similar to the one shown on the dust jacket of this book)—partly measurable (visible) and partly not. Ignoring the invisible portion of an iceberg because of its invisibility is not necessarily a wise risk management decision. Any definition of risk that does not include risk in its entirety is like only worrying about the layout of deck chairs on the Titanic. The world of investing floats on a vast sea of words, most of which are obvious, simple-minded, and clichés, and all of those are dangerous to financial health. The story of this book bears no relation to all that stuff. 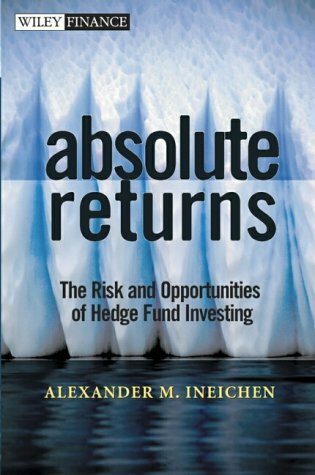 Ineichen's message is original, powerful, comprehensive, and essential to robust financial health. The literary clarity he blends with his financial wisdom is an additional blessing.